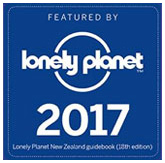 The obvious one to begin with is the Waitahanui River, being practically on our doorstep and arguably the most famous. The Waitahanui is spring fed and as such, is often still clear even after a heavy rain when others are unfishable. Access to the river is very good, with a carpark on State Highway 1. 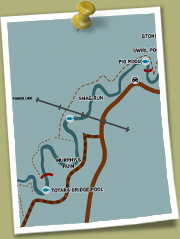 There are good walking tracks that follow the river upstream to the various pools. Fishing at the river mouth is always popular and you'll often see a line of fishermen in the water - the renowned "Picket Fence". The other rivers you must try in the area are the Hinemaiaia - only a 10 minute drive south of the lodge, also the Tauranga Taupo and the Tongariro at Turangi. 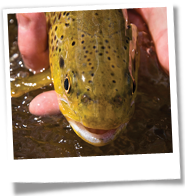 These rivers all offer great year round fly fishing. You don't have to go far. Rotongaio Bay has some great hot spots. Harling off the river mouth can produce a good catch. There is a drop off not too far from shore where you'll often see boats trolling and harling. We have a 15lb rainbow mounted in the lodge shop that was caught off our boat ramp using a spinning rod. Further out in the lake, the Horomatangi Reef and the White Cliffs can also provide good fishing within 20 minutes by boat. Our own boat ramp is free for guests to launch their boats so you can be on the fishing spots within 5 minutes. View and print our map of the Waitahanui River's fishing hotspots showing foot and car access. Or stop in at our tackle shop for a copy before you head up the river.